You are here: Home / Is It Paleo? / Is Diet Soda Paleo? We’ve been getting a lot of questions here at the Ultimate Paleo Guide relating to artificial sweeteners. In particular, lots of you have been asking whether or not diet soda can be considered paleo. If you just want the short and sweet answer, I’ll sum it up for you right now. NO, diet soda is not considered paleo. So there you have it. End of the article. Enjoy the rest of your day. I kid, I kid. I wouldn’t feel right if I just told you that diet soda isn’t paleo and just left you with that. Does diet soda increase or decrease appetite? Does diet soda lead to weight loss or weight gain? What goes on in your body when you drink diet soda? Remember, the paleo approach to nutrition favors healing your body from the inside out. You want to be consuming the most nutrient-dense foods and avoiding those that contain anti-nutrients and which lead to health problems. So instead of asking whether or not diet soda is paleo, let’s look at it like this. Why am I drinking diet soda? Is it because it provides a range of health benefits? Is it purely because I enjoy the taste? Do I feel the need for a little caffeine boost? Am I trying to avoid calories, carbs, and sugar? Do I have to drink because I’m addicted to it? Yes, the pun there was entirely intended and, no, I will not apologize for the cheesiness of it. The No-Cal Soda Pop was introduced in the 1950s as the first diet soda available to consumers. It was originally created using saccharin, which is commonly know as Sweet ‘N Low. The drink was designed to be a healthy alternative to soda, pop, cola, or whatever the kids are calling it these days, for diabetics. Today most of the population consumes diet beverages to avoid excess calories, carbohydrates, and sugar. According to a study from the National Center for Health Statistics, about 20% of the population aged two years and over consumed a diet beverage every day in 2009-2010 (6). The study also showed that diet beverage consumption increased over twelve years (from the study year 1999-2000 to the study year 2009-2010). 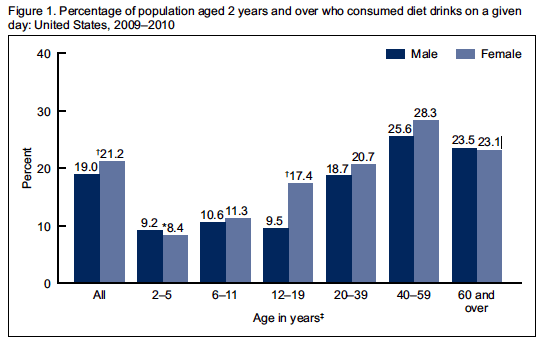 In 1999 17.8% of females and 13.9% of males consumed diet drinks. By the year 2009/2010, those numbers had risen to 21.2% and 19%. This could be because of increased marketing campaigns, an increased pressure to look good, the increase in phrases used to emphasize “health”, or many other things. Have you ever taken a look at the label of a can of diet soda? I mean a real good look at the label? Have you ever wondered what the heck those unpronounceable words mean? Let’s take a look at some of the key ingredients of diet soda. Carbonated water: Water into which carbon dioxide has been dissolved. Hmmm, carbon dioxide. Isn’t that something our bodies try to rid themselves of? Caramel color: I found this to be a weird ingredient. Despite the name caramel, caramel color actually has no taste. It is only used to add color to the drink. 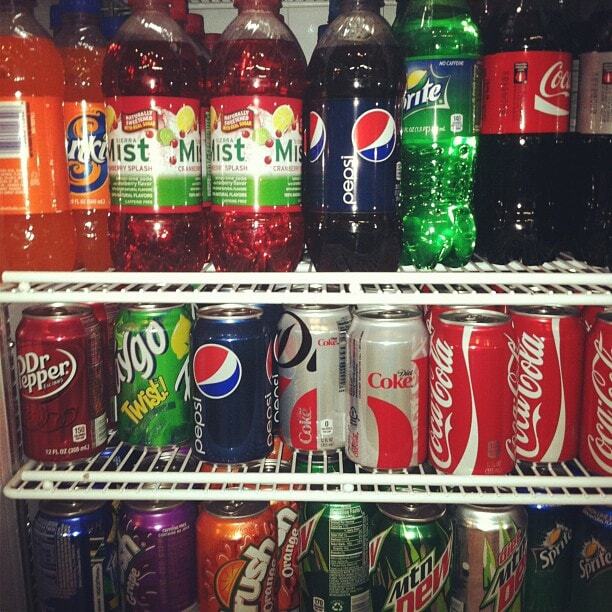 I suspect this is because manufacturers want to give diet soda drinks the appearance of regular soda drinks. Caramel color is made by heating fructose, dextrose, or other sugars with sulfuric, phosphoric, or citric acids. 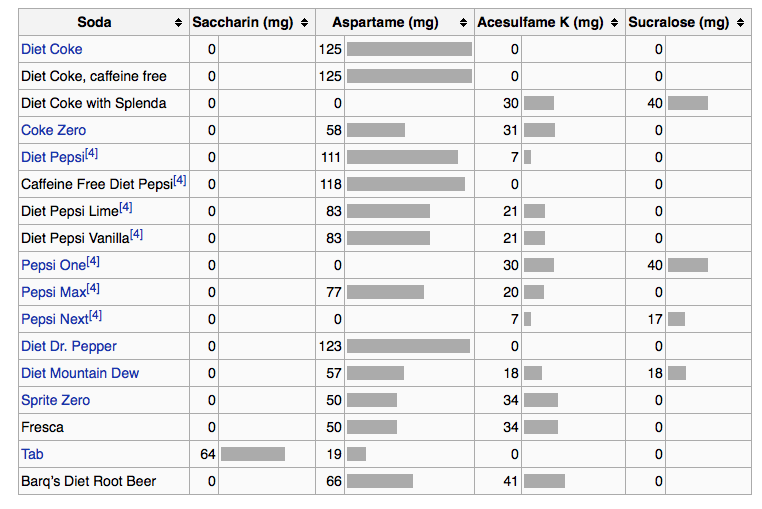 Aspartame: Other artificial sweeteners such as saccharin, sucralose, and cyclamate have also been used in diet sodas. Cyclamate was actually banned in the US in 1969 because of concerns that it caused too many health problems. Aspartame is the most commonly used artificial sweetener today. It is made of aspartic acid, phenylalanine, and methyl ester. It is up to 200 times sweeter than sugar. The acceptable intake of aspartame has been set at 50mg per kilogram of your bodyweight. It is broken down in the small intestine into the ingredients mentioned above. From there it may or may not enter the blood stream. Research on animals has shown that it is linked to occurrences of cancer and brain damage. The FDA has listed 92 side effects of aspartame (5). It is recommended that pregnant women and children do not consume it. We’ll be talking a little bit more about artificial sweeteners and aspartame a bit later. Potassium benzoate: Alongside ascorbic acid, potassium benzoate is considered a carcinogen. Natural flavors: The definition of natural flavor under the Code of Federal Regulations is: “the essential oil, oleoresin, essence or extractive, protein hydrolysate, distillate, or any product of roasting, heating or enzymolysis, which contains the flavoring constituents derived from a spice, fruit or fruit juice, vegetable or vegetable juice, edible yeast, herb, bark, bud, root, leaf or similar plant material, meat, seafood, poultry, eggs, dairy products, or fermentation products thereof, whose significant function in food is flavoring rather than nutritional” (21CFR101.22)(2). Not sure how I feel about this definition. Citric acid: Mainly used as a preservative. Caffeine: Most companies use this ingredient because it has the potential to create addiction or dependence. Ever tried to quit coffee after drinking a cup or two a day for years? So why are you drinking diet soda? Many people drink diet soda because they think zero calories = good. Zero sugar = good. And maybe even zero carbs = good. But does this mean that it’s OK to consume as many zero calorie and zero sugar products as we’d like? Now I’m a huge fan of research when it help us improve our health, but sorting through a load of studies can be overwhelming. You find one study touting one food and another telling you how bad that same food is for you. And because diet soda and artificial sweeteners haven’t been around all that long, there is limited relevant research out there on them. The studies that have been conducted have had mixed results. There is not a lot of good evidence out there that drinking diet soda causes weight gain or health complications (unless you are drinking a ton). But the one thing that the studies seem to agree on is that drinking diet soda leads to poor dental health because it is acidic. Another question asked in studies on diet soda is whether or not diet soda elicits a hormonal response in the body, leading to increased hunger. If you Google “artificial sweeteners” and “appetite” or “hunger”, you’ll find a decent amount of MIXED research on the subject. Artifical sweeteners may stimulate overeating due to “sweetness satisfaction.” Your brain has the ability to distinguish between real sugar and the artificial stuff. Artificial sweeteners are typically 100-400 times sweeter than regular sugar, so the message they send to the brain is that a lot of sweetness is coming in. The problem, however, is that artificial sweeteners do not supply much satisfaction. They don’t come with any calories or energy, which is what your body and brain are waiting for. This may cause your body to crave more of them or more real sugar (that can provide the energy the body and brain are looking for). Only sucrose, but not sucralose, stimulation engages dopaminergic midbrain areas in relation to the behavioral pleasantness response. Thus, brain response distinguishes the caloric from the non-caloric sweetener, although the conscious mind could not.This could have important implications on how effective artificial sweeteners are in their ability to substitute sugar intake. Basically, your brain can tell the difference between artificial sweeteners and the real stuff. This is one reason that many researchers believe that artificial sweeteners and diet soda in particular can stimulate overeating. I’m not going to argue against that, as it is a very valid claim but, in my opinion, overeating due to artificial sweetener consumption is more about dietary displacement. Dietary displacement happens when you consume a diet beverage, zero calorie product, or sugar-free item and think you can eat more of that thing because it contains no calories. We end up underestimating the number of calories we consume (thinking about the zero calories we take in) and eat more later on. 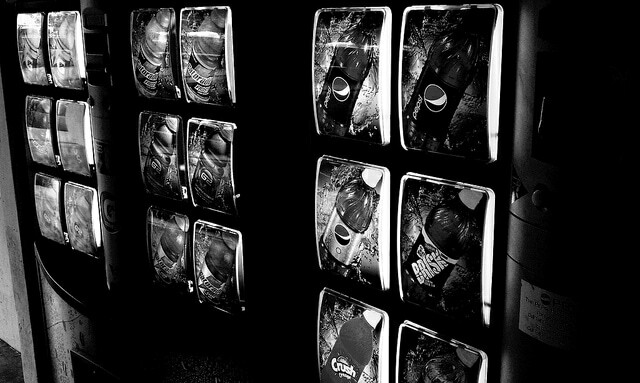 While there is a decent amount of research out there suggesting that diet soda and artificial sweeteners may be related to metabolic syndrome, depression, obesity, weight gain, and type 2 diabetes, I am finding that most people who consume these beverages are already gaining weight and seeing risk factor symptoms. In my opinion it may not be the diet soda that is the problem. It’s the sedentary lifestyle and processed food diet. In another study there was evidence that the more diet soda people consume, the more likely they are to be overweight. (1) (1A). The dietary habits and body weights of a group of middle-aged women were tracked for a year. Those women who consumed diet soda were more likely than those that did not drink diet soda to gain weight during the course of the study. For each diet soft drink our participants drank per day, they were 65 percent more likely to become overweight during the next seven to eight years, and 41 percent more likely to become obese. Let’s go back to that initial question posed at the beginning of this article. Why are you consuming diet soda? If you’re drinking a Diet Coke once or twice a week, from the research I’ve considered, it looks like you’ll be OK. But if you’re drinking one or more a day, you may want to start cutting back. All the research I have found says that pregnant women and children should be avoiding the stuff completely. For me, that means I should be avoiding it completely as well. And if you’re trying to kick the sugar habit, it may be in your best interest to avoid the stuff, as it seems to confuse the body. So, again, diet soda is definitely NOT paleo but, as with most foods, I believe that taking a look at your own experiences can tell you a lot more than any research, study, or opinion you find online. Diet soda messes with my gut. I hate the taste. The existing research is fairly inconclusive when it comes to the long-term health implications of drinking it. I also just don’t want a ton of chemicals in my body. So I stay away from the stuff. What you do is up to you. What has your experience been with diet soda and artificial sweeteners in general? Do you consume them regularly? Let us know in the comments below. 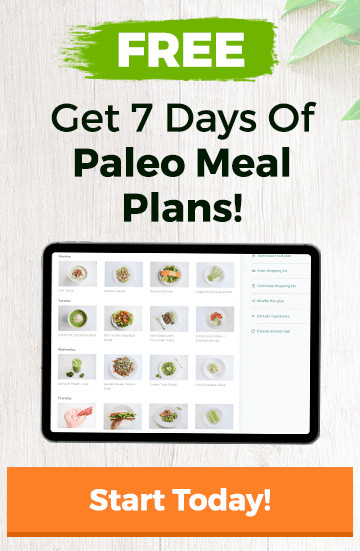 If you have more questions on paleo foods, download the official Paleo.io app and never wonder again whether or not a food is paleo. I have asked before and still have not received a response…is ZEVIA paleo friendly? It contains Stevia. I gave up the traditional diet soda when I started Paleo but I do drink ZEVIA. Since stevia is natural, I have allowed myself this indulgence! Thanks for contributing. I think the most important thing is to figure out if it’s working for you. If you’re where you at with your goals and accomplishing what you’d like with your Paleo approach then an occasional Zevia should be fine.